We are pleased to announce this lecture / recital on “Shakespeare’s Songs”, featuring Christopher Ricks as lecturer; Dana Whiteside, baritone; and James Johnson, piano. 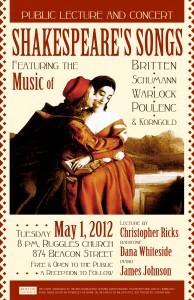 The program features songs set to texts by William Shakespeare. Composers include Peter Warlock, Robert Schumann, Benjamin Britten, Francis Poulenc, Roger Quilter, and Erich Korngold. The event is TOMORROW, Tuesday, May 1 at 8:00 p.m. at the Ruggles Church. The church is near Boston University’s South Campus residential area, across from the Elephant Walk restaurant on the corner of Park Drive and Beacon Street. For directions, see http://home.rugglesbaptistchurch.org/get-directions. Admission is free; a reception will follow. Dana WHITESIDE is a soloist and chorister with Boston’s Emmanuel Music. A graduate of the New England Conservatory of Music, Mr. Whiteside has performed as soloist with the Cantata Singers, Vox Humana, and the Florestan Recital Project in such works as Carmina Burana, Brahms’ German Requiem, and Bach’s St. John Passion. Mr. Whiteside is Deputy Director for Community Economic Development in the Boston Redevelopment Authority. James JOHNSON is Associate Professor of History at Boston University. He is the author of two award-winning books and numerous articles and reviews. As pianist, Professor Johnson delivers regular lecture/recitals on music in its cultural, social, and political contexts. During his 15-year collaboration with Dana Whiteside, the pair have explored themes touching German romanticism, American composers in Paris, European music between the two world wars, and the French fin-de-siècle.